I should be sleeping, seeing as how i barely got any in the last week, and a probably won't get much next week either. but the lure of a not-slow internet connection is just too strong. not that i have anything to do online anyways. Finished reading two books last week, where i found the time God only know.. The first one was "The Story of Srebrenica" by Isnam Taljic. It was, for the lack of a better word, great. But at the same time I don't know what to make of it. It was refreshing but at the same time, how can someone be refreshed by what happened there? I found myself asking, what was the point of this book, where is it going? but then i realised, there doesn't have to be a point, as in, an end point. after all, its the journey that counts, and the book is just that. a journey through the minds of two people, from two different generations, and while seemingly random in their narrations, everything sort of adds up, but at the same time it doesn't, which is perfectly okay. Does that make sense? 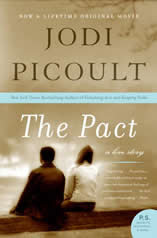 The second book a read was "The Pact" by Jodi Picoult. It had been sitting on our shelf, unread, for a good several months, which I thought was odd given that me and my sister usually devour books immediately. But in hindsight, i guess why i didnt read it straight away is that at the time, i just read 3 of her other books, and was getting tired of her style, much like how i grew sick of the style of that guy who wrote "The Da Vinci Code" can't remember his name. on the whole, the book is not something i can relate to, but i fragments, yes. Shan't say much more in caase i spoil it for people who want to read it, or bore those who couldn't care less. Really ought to give my poor panda eyes a break now... it was a tiring day. It's great that you managed to read those books considering the tight schedule you've in architecture... I haven't read a book for roughly two months (apart from textbooks, well, those don't count)... Actually I'm worried that I'm being much affected by some specific Internet sites and accepting what's there at face value rather than delving deeper into other sites, books and other sources of information... Hence my question on Freakonomics- I really need feedback on this. Well, the first book I had to finish reading it since I already renewed it the maximum number of times from the library. I borrowed it more than a month ago but never had the time to read it even though I reaally wanted to. And the second one, I was just bored and procrastinating on my projects...which happens a lot! I know many people who love reading Jodi Picoult's writings, but hers can get tiring too. Very lengthy, contemplative stuff. And how did you find the time to read two such thick books in a week? 8-O Unputdownable, eh? Btw, it was nice meeting you yesterday for the first time, finally! :-D I'll see you next week? Hey anisah! yeah, i generally avoid reading the same author in a row, because their style of writing gets kind of boring. which is why i don't really have a favourite author..